New Reading and a Raffle! Meant to Be…KISSED is available as an ebook on Amazon. Meant to Be Press announces the release of Meant to Be…KISSED (Love Notes Book 2). This is the second collection of sweet of stories from Meant to Be Press authors. This heartwarming collection is themed around winter kisses. The two primary stories are historical romances, with a bonus contemporary flash fiction piece from Meant to Be Press’s newest author, M. M. Genet. Meant to Be Press is celebrating the release with sales and raffles! November 22-25th: For five days only, Tempo of Temptations by Lela Bay and Lord Harrington’s Lost Doe by Emmy Z. Madrigal will be on sale for $0.99 each! November 19-30th enter to win free Meant to Be Press ebooks. Prizes include the Meant to Be…MINEanthology, Tempo of Temptations by Lela Bay, Lord Harrington’s Lost Doe by Emmy Z. Madrigal, and The Harpist by M. M. Genet and Michele Roger. Love sweet romance? Meant to Be…KISSED is a collection of short stories to sample Meant to Be Press romance authors. Finally, as a bonus, check out the contemporary romance flash fiction from Meant to Be Press’s newest author M. M. Genet, “A Year and a Day.” Behold of the promise of the future. Like the seasons, love has many variations, so let these stories inspire you to discard what holds you back and welcome new opportunities. Read it for free through Kindle Unlimited, and remember to enter the raffle for other Meant to Be Press romances! In Undecided, Cynthia Porter is dealing with much more than any high school girl should be asked to withstand. She’s at odds with her current love interest, famous boy bander Derek Montgomery. Her mother is verbally abusive and violent, pushing Cynthia out of the house. Her best friend can’t even console her since she’s recovering from a bad weekend injury. Living out of a gym bag, Cynthia stays with any friends who will take her in, but things don’t make her life any easier when she starts hooking up with random guys. Victoria Knox, recovering from her kidnapping injury, finds her boyfriend can’t stop blaming himself for letting her get hurt. She just wants to put the whole mess behind her and get on with her singing career. There’s only six more months to the freedom of graduation. Can the girls make it without losing their way? When a camp counselor goes on patrol, she finds an extra cabin in the woods that no one knows about…or do they? An ailing mother and her daughter are terrorized by a disembodied face. Girl Scouts in the 40s experience a frightening occurrence in the woods. Two friends out drinking at night discover the real horrors of Goose Meadows. To celebrate the release of Quoth the Raven, edited by Lyn Worthen and published by Camden Park Press, I’m getting cozy with my fellow anthology contributors to learn more about their stories and what inspires their dark little writers’ hearts. Next, I’m interviewing Emerian Rich, author of “My Annabel” in Quoth the Raven. Quoth the Raven celebrates the eerie and influential legacy of Edgar Allan Poe. What is it about Edgar Allan Poe’s work that speaks to you (perhaps from the grave)? He just gets us, you know? His mind created some of the best moments in horror by just understanding how we like to be scared. Pick a couple adjectives to describe the story you wrote for Quoth the Raven. Tonight and this weekend – Meet Emz! October 11th, 13th, and 14th! Join us for the second annual Tales of Horror. Costumed authors will read from their scary works! Join HorrorAddicts.net and authors Mercy Hollow, Emerian Rich, E.M. Markoff, and J. Malcolm Stewart at Sinister Creature Con. Look for us at a vendor table in the Main Hall. 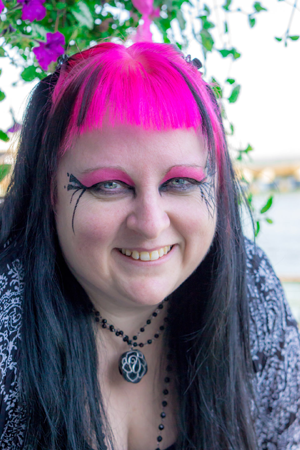 This week Rose and Jaymi chat with Emerian Rich of HorrorAddicts.net. They discuss the treats of the fall holidays such as a new season of American Horror Story, a new Halloween Movie along with all the old favorites being shared on network TV, Pumpkin Spice things as well as exploring the whole Horror Genre. Emerian Rich talks about her projects and growing up where Horror in every aspect was banned which only increased her love of all the dark goodies she found. Enjoy this horror flavored episode of Tarot Visions. Emz is gearing up for a busy season! Besides the podcast finale, online events, and private events she is speaking at this fall, here are some public events you can catch her at! Gain a deeper understanding of Catherine Morland by looking at her horror fan side. Was she just a silly young miss innocent of the real dangers of the world, or did she enjoy horror literature on a more intimate level in a way that fans of horror media today can relate to? Author Emmy Z. Madrigal (aka Emerian Rich) will give insight on this most misunderstood heroine. What is Your Favorite Bay Area Memory?